Can you stand it!? How beautiful is this? The color is so vibrant. The pattern is so energetic and wild. 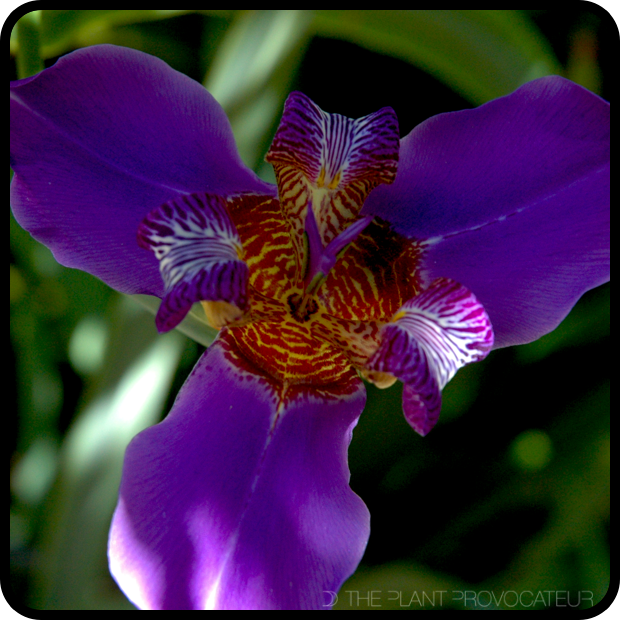 The solid petal color is an amazing companion for the exotic electricity of the inner petals. Have you met Neomarica caerulea? Here's an overhead view of some serious floral magnificence. 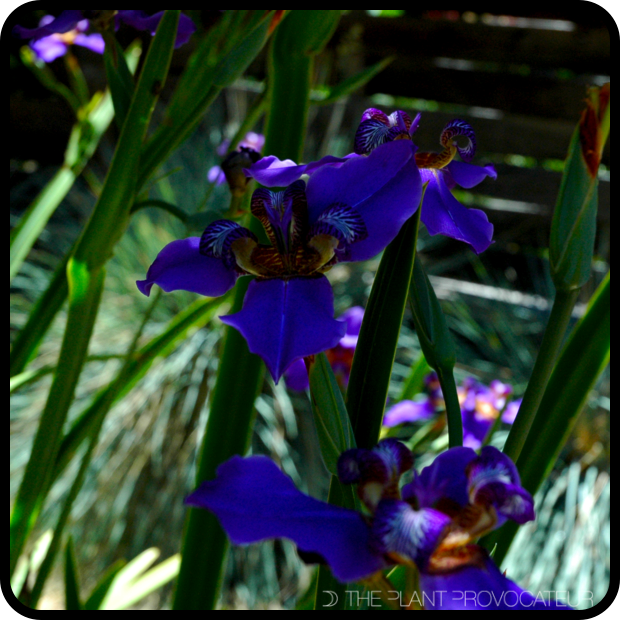 Neomarica caerulea is an Iris relative that comes to us from Brazil. It a rhizomatous perennial that produces erect, 3 to 4 foot, sword-shaped leaves with a fan-like spread. 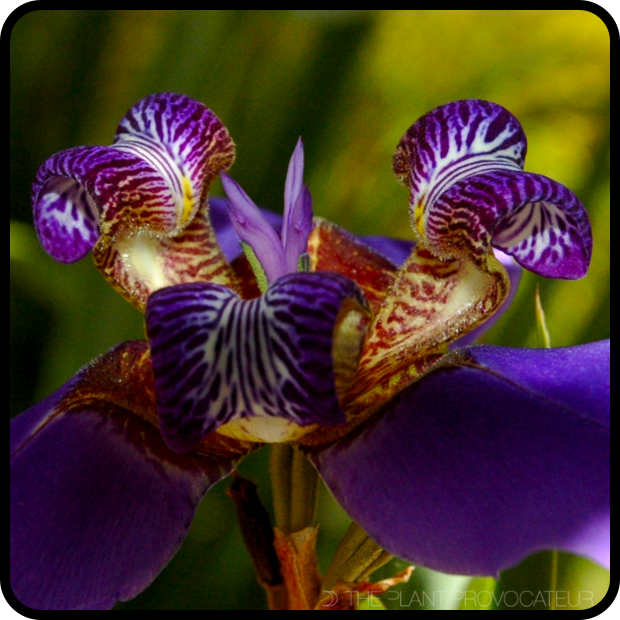 In early summer, branching stems of buds rise to produce rich purple to blueish purple flowers with intricate centers that possess a tropical tiger print pattern. The flowers, themselves, last for only one day but are usually followed by succession of additional blossoms. This timeframe makes each and every flower of this plant so special and spectacular. Neomarica caerulea likes full sun/part shade, regular water, and to grow perennially, temps no colder than 40 degrees fahrenheit/4 degrees celsius. Now, for majority of those in the U.S. this plant can only be grown outdoors in the warmer months and indoors when temperatures drop. I don't know about you but when I see a plant that is so beguiling and so unobtainable I must have it. There are so many brilliant exotic looking plants out there I figure why not experiment. So I play around with creating adaptive environments. My efforts are usually rewarded and along the way I always learn something new about plants. Why not celebrate their beauty by growing them?